These little ones are about 6 inches tall to top of ears. The main part of this pattern was taken from my Lil' Trouble Teddy series. 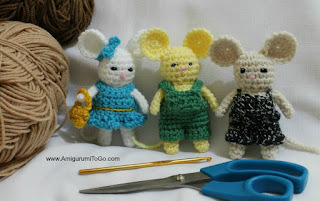 I just made the legs longer for this mouse and made clothes for them as well. 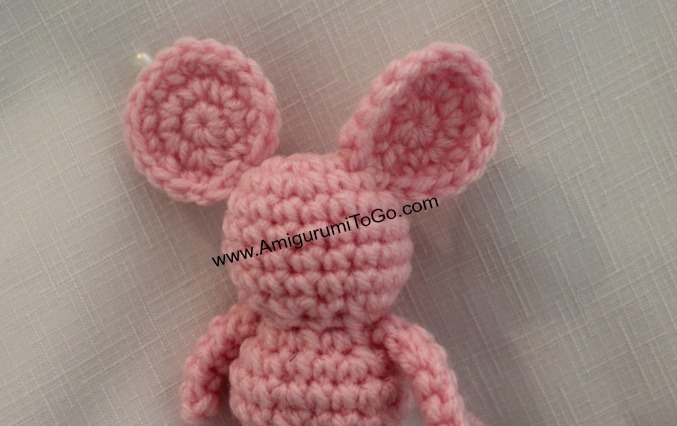 The head and body are the same as the Lil' Trouble Teddy so if you need help with the written pattern I have a video showing how to crochet the head/body and how to stuff and shape it as well. The video links are given below in the pattern. There are patterns and video tutorials for the outfits. sl st next st and f/o leaving a tail long enough to sew up the gap. 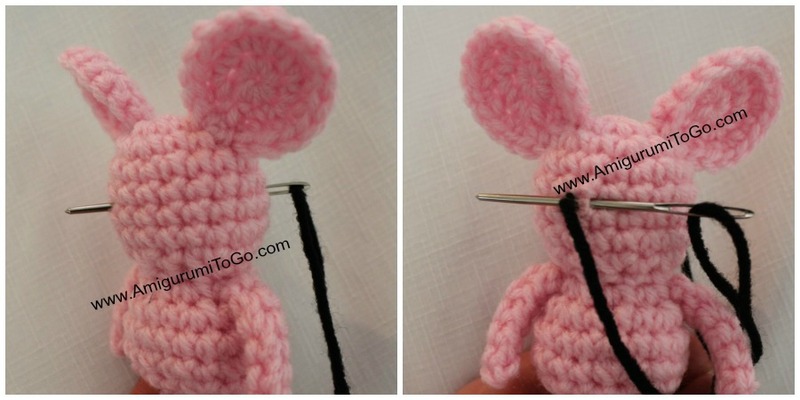 (You can use this yarn tail to make the mouse's tail, just make sure it's got a good length to it). Weave in and out of the FLO of the remaining st, stuff the rest of the body firmly and full, shape as you stuff. If it's too hard to stuff while the gap is open wide just pull on the yarn tail to close up the gap a bit, then stuff some more. Make sure to shape as you stuff. Use a stuffing stick or the back end of a pencil to push the stuffing into the right spots. If unsure how to shape please view part one of the video tutorial. Pull the yarn tail to close up the gap. Pull the yarn tail through the back of the body and just leave it hanging for now. We'll come back to it later. 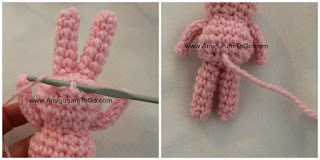 *If you have any troubles with the arms of the pattern please view part two of this video tutorial. For this mouse I've made the arms longer than the ones shown in the video but other than that they are the same, sewn up the same way, and sewn onto the body the same way. you can stuff the legs very lightly so they hold their shape. Use the back end of a pencil to push the stuffing in. Just a little tiny bit of stuffing does the trick. 2) Sew the legs on. Some people will find these smaller amigurumis hard to sew together. I used to as well, I used to dread sewing things together! The trick is to relax, don't hold things so tight. Let the yarn needle do the work. Pin the legs on first to make sure you have room for both legs. Take one leg off and gently sew the first leg on. Once that's done, sew the 2nd leg on. 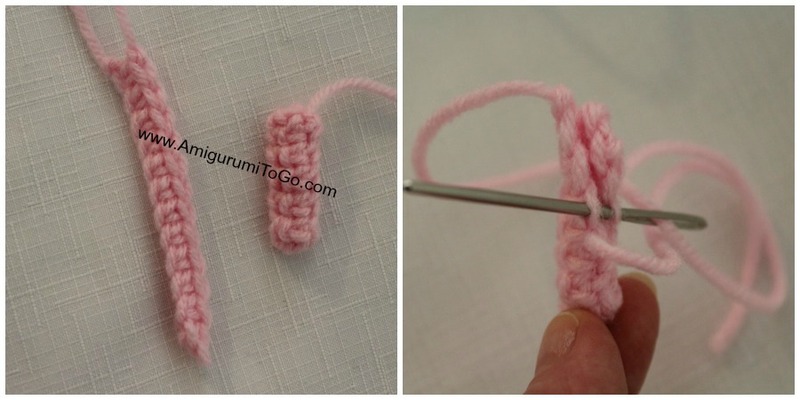 Cut the remaining yarn tails up shorter then hide them inside the body. 3) Sew the ears on. I sewed my mice ears up high. Pin them on first. You can sew around the pins. Once the bottom edge is sewn to the head you can shape the ear with a stitch or two. Just pull the yarn through the edge a bit high up then bring the yarn through the head and pull, play around with it until you're happy with the shape. 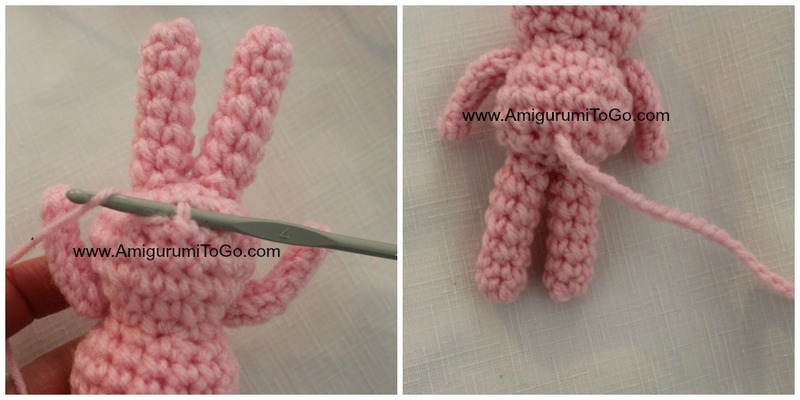 Knot off and hide the yarn tail inside the head. 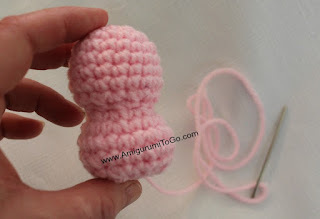 4) TAIL: if you have enough of that yarn tail left when you f/o the body, now you can make the tail with it. Pull it through a lower, center stitch hole of the body. Insert your hook and ch20. f/o and pull tight. If you don't have enough length to make a tail then just make a chain of 20 and sew it to the doll that way. At the finishing end you can add just a little dab of glue to the knot if you're worried the chain will unravel. 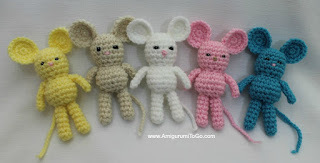 I've not noticed it unraveling at all so I didn't add any glue to my mice. Just be sure to pull that knot tight. Don't cut the excess yarn tail too close to the knot, leave about 1/4 inch. The eyes are yarn wrapped in between the 5th and 6th row. Using a pin, I dotted on white paint to add a bit of life to the eyes. Just below the eyes I whip stitched a nose in with pink yarn. I just kept it simple. You can even leave them faceless. Play around with different things, use buttons or felt. It's up to you! Yay! You're back!!! Oh how I've missed you. 🙂 I absolutely love your patterns. I have learned how to read patterns and make cute little animals and their clothing because of you. I'm in the hospital a lot and it gives me something fun to do. Thank you so much! So sorry you're in the hospital a lot. But I'm glad you've got yourself something to do while you're there. I love making stuff too, it brings me joy. I just noticed that you were back and I am so happy! Your patterns are my favorite of anyone, paid or free! Thank you so much for all you do! I am excited to make some mice and a room for them! Thank you for sharing this. God bless you. 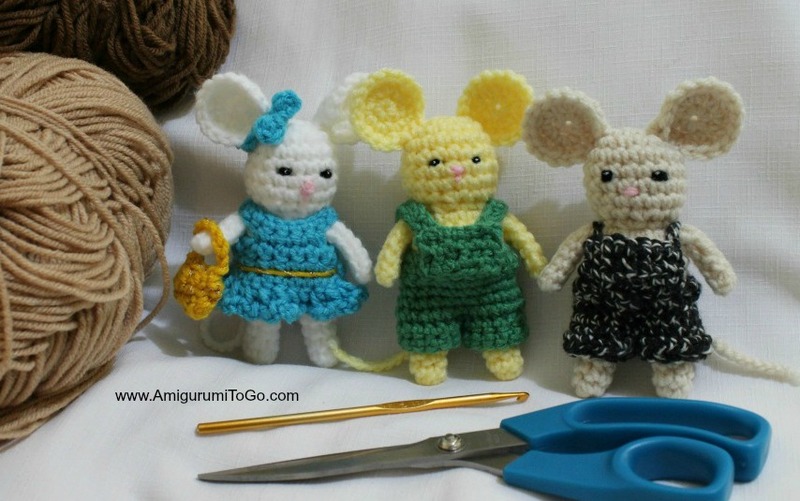 I am so excited to make this mouse, your patterns are great, and I love mice. I'm hooked :0 just love all your patterns thank you and welcome back!